What would happen if you just let it all hang out, turned yourself upside and let all the old ideas flush out of yor brain, creating space for whatever wants to come next. There are times when the feet must be fully rooted into the earth to pull up the medicine of groundation and gravity. And there are times when we defy grafity, swing ourselves upside down. And hanging in a way that doesn’t feel like slipping or risking a fall. Hanging like just hanging out. Hanging out like this is home for now. Releasing the feet to the air and the head towards the ground. Hanging on and hanging out, with a slow gin fizz in my right hand, sipping, suspended, watching, waiting, enjoying the almost summer, the dripping moonlight and the shadows that I cast against the ground as i look at them from above. Upside down everything looks totally different. I will travel 2000 miles in order to gain a different perspective. The movement is pure catalyst for the process, but there is nothing different really- here, there or anywhere. It’s all the same when you walk with the same walk and see with the same eyes and notice things from a very right side up position, the position you are used to. But when you decide to shake down a million pounds of weight, to let the wind blow cigar smoke around the body, when you breath yourself out of the black fog, and take on new eyes from under the veil, everything changes. It’s never about where we are, but about how we choose to see. When I hang, I get to see what grows closest to the ground. To breath down and up instead of up and down. To decide to show up inside myself and let my heart hang towards my brain, so it pounds out the past, and beats up the old ways. Hanging upside down pulls the blood from my feet loosening new routes for exploration, loosening crowded highways, loosening the internal grips. Hanging is willing to gently swing above a fire in the dark of the night. Hanging is willing to burn off to the side and be patient as to when it’s time to blow off the ash. As creatures of this universe, freakish, hairy, shaved, broken hearted, creative, exhausted, wounded, healed, lit up lovers, whores, saints, queens and tricksters, all of us are here, breathing, shifting, moving, living- we can never really be still, we can never be stagnant, we are evolving every time we sip in the air and every time we allow it to stream out our mouths. Life changes in every single turn. And so must we. We can change our position and see things in ways we never saw them before. Why not be radical and do it totally upside down to get to a place of right side up? 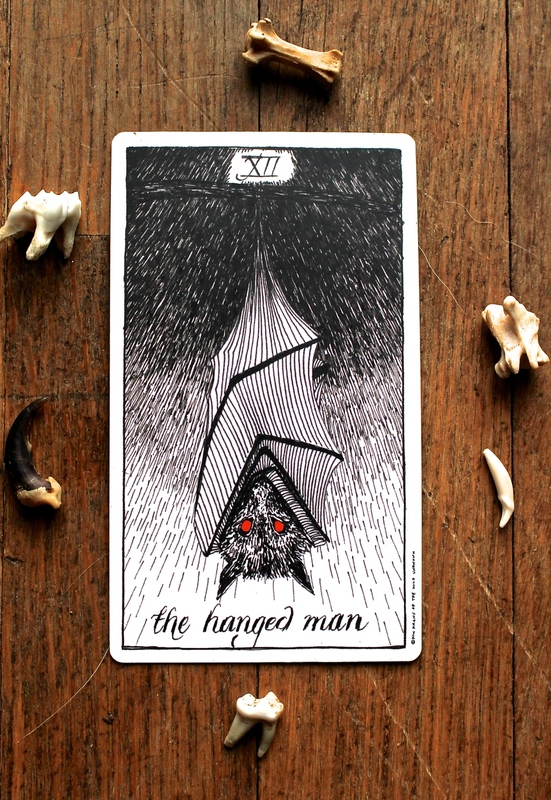 The Hanged Man is about trusting this process. About intuition. Really. The bat uses echolocation to explore and survive in the world around him. We think we use our eyes and our hands, and we do, but we are also invited to use something else:: Intuition does not mean knowing, it means understanding without a reason in sight. The Hanged Man is waiting right where we are. Trusting that intuition. Trusting that we can just hang out and see things with a different vision, not act, but just 'see'. The absolute disasters. The severed lives. The lost sanity. The deaths and the births and the who knows what kind of heartaches around the corner. The celebrations and the jubilees. The flowers growth and it's petals scattered. As everything changes and happens, hanging can wildly re-inform us about the mystery of what unfolds around us. This card says don’t jump. Don’t say yes or no or maybe. Just don’t say anything. Just hang out and trust, shift what you though you knew into something you have know idea about. Proclaim the mystery of your faith- in your own matter and essence, in your hair and your blood and your bones and they way your eyes flutter just as you are about to fall asleep. Trust the ache. This pain. This fantastic feeling of being upside down and inside out. Trust that you don’t have to be anywhere but here. All wrapped up in your wings. Floating but secure. Hanging but grounded. Knowing nothing but fully aware of what is changing, what must change, what never stays the same.